How responsible is architecture for the wave of violence that afflicts our western cities, with Paris in 2005 as the most recent example? Wouter Vanstiphout discussed this subject in Leuven. 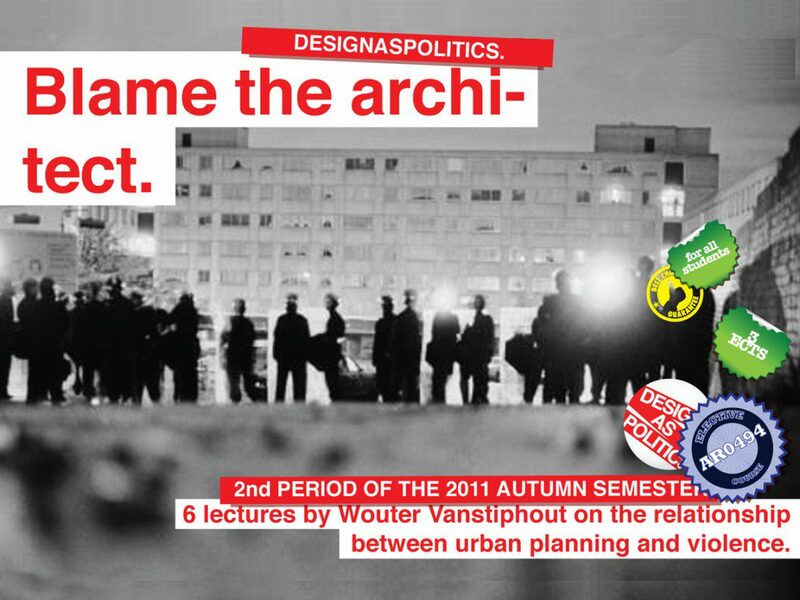 And although the title of his lecture - Blame the architect! - suggests otherwise, Vanstiphout argued that the architect is not guilty. The inclusion of Wouter Vanstiphout in the lecture series organised by City and Architecture in Leuven is notable — a lecture from a non-architect in a series devoted to architecture was at odds of the time-honoured tradition that Flemish architecture speaks for itself. ‘Architecture is architecture is architecture’ is the mantra, and the theory must dutifully concentrate on illuminating unique bodies of work. Vanstiphout, however, demonstrates the value of architectural theory as an independent and professional practice. Vanstiphout began his presentation by explaining his unusual practice of his profession. The new-style architectural historian is primarily an enthusiastic follower of the ideology of ‘meddling in everything’. So in his various lives Vanstiphout has meddled in the practice of building, designing and policy-making in various guises: Crimson, WiMBY, INTI, the chair in Design as Politics, and lots more besides. This architectural historian new-style is, in the second place, a person lacking characteristics. That emerged clearly again and again in his lecture on architecture, urbanism and riots. Right from the start Vanstiphout made clear that his own point of view in the question of blame is unclear. What followed was an extremely absorbing and equally inimitable reconstruction of the responsibility of the architectural discipline in the question of urban violence. A rapt silence descended on the select architectural audience as they listened to the phenomenology of urban violence that Vanstiphout presented, and he occasionally admitted that he no longer understood the connections. Yet a number of story lines stood out in his presentation that can lead us to the question of guilt. 1) Urban riots spread according to architectural typology, not to geographical location. The modernist residential districts formed the hotbeds of violence during the 2005 riots in Paris. The riots spread like a bacterial sickness to the suburbs of Lyon, Lille and other cities. The high unemployment among young people in these districts created an alienating daily rhythm of sleeping in the morning and raising hell in the afternoon. 2) The burning modernist districts were attributed to the godfather of modern architecture: Le Corbusier. Thus it is not the political authority that commissioned the neighbourhood that gets the blame, but the people who ensured their added aesthetical value and/or devised the concept for them. Just like in John Calhoun’s experiment with rats, the limited living space is viewed as a breeding ground for deviant behaviour among young people pampered by the welfare state. 3) Architects deny all guilt and thus betray their deepest desire to change the world. This refusal can be traced back to the crusade launched by Jane Jacobs against anti-social, mechanical and anti-urban housing production. Belief in the power of architecture continues in President Sarkozy’s mobilisation of a choice selection of the starchitects — Rogers, Nouvel, MVRDV, Portzamparc, and many others — for a new undivided Paris. 4) Urban riots start with an ordinary action taken by the police that the victims for once do not accept. An innocent incident is the spark that ignites a screaming explosion of anger. With a careful 3D reconstruction of the raid in Detroit in a blind pig (a drinking establishment that stays open after closing time), Vanstiphout showed that the scene of the crime complies with all the standards drawn up by Jane Jacobs for cosy neighbourhoods with a human scale. 5) The modernist neighbourhoods form the ideal décor to bring and keep young people under control. During the Broadwater Farm riots (Tottenham, London, 1985) the West-Indian agitators were forced into the modernist district from the adjoining Victorian neighbourhood. A cat and mouse game between the youths and police ensued along the edges and fault lines of the neighbourhoods. 6) Riots are not isolated phenomena but occur in a season of urban revolt. The riots in Detroit extended over many years. The riots in Broadwater followed a week of riots in the London district of Brixton. In Los Angeles it was even a case of a delayed effect: while the trigger took place in 1991 (Rodney King was pulled out of a car and beaten), the riots only erupted in 1992 (the court case featured white jurors only). 7) The media is an essential factor in urban riots. While the press covered the Detroit riots from some distance, the British tabloids went to town on the Broadwater riots. In LA the media even spurred on the riots with the live coverage every day, and in Paris the media was a strategic weapon for both youths and Nicolas Sarkozy, who was Interior Minister at the time. 8) In popular culture the youths identify with the modernist districts. Vanstiphout referred to the Motown music scene, the white punk of The Clash, the gangsta rap in LA, and the urban film La Haine. In all cases the modern city figures as a dystopian backdrop. 9) The urban violence runs parallel to idealistic urban renewal projects. What seems to be a Messianic deed in the eyes of the planners is a monstrosity in the eyes of the rebel youths. And they’re not wrong, for urban renewal is often synonymous with social cleansing. The violence is therefore not aimed at form or typology but at the plans intended to improve the living conditions of the discontented masses for once and always. With this and other observations Vanstiphout carefully deconstructed the responsibility of the architect in the explosions of urban violence. In the closing discussion he even pleaded for the innocence of the architect at the expense of the reckless planners. In that sense it is very understandable that Vanstiphout dismissed his earlier architectural belief in New Towns as a disastrous approach. That brings him into line with the pragmatism that has meant that eruptions of violence have been avoided up to now in the Netherlands. Dutch urban renewal projects invariably take the form of small, specific, confined interventions so that social cleansing occurs very gradually. At the same time, the palliative care of an army of cultural agents tackles unnecessary upheavals preventatively — and there’s no better example of that than WiMBY! Wouter Vanstiphout delivered his lecture on 3 March in STUK, Leuven. The meeting was organised by Stad en Architectuur.